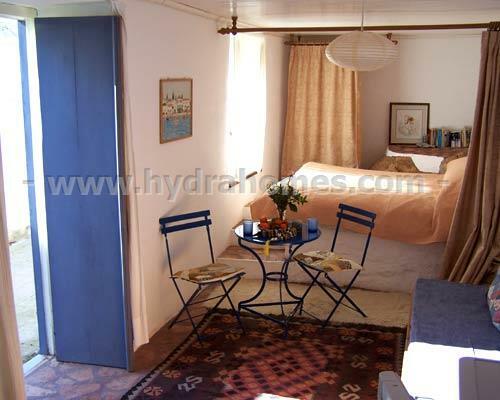 Property for sale in 4 Corners, Hydra, Greece. A good sized house near to Four Corners on Hydra in excellent condition - move in tomorrow. 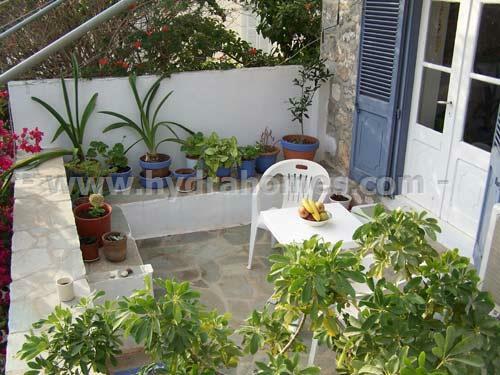 A good sized house near to Four Corners on Hydra in excellent condition - move in tomorrow. 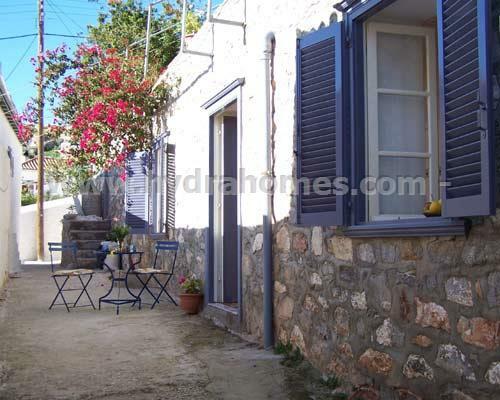 The main house is about 100m2, on a plot of 196m2. This house has an unusual layout for Hydra in that the living space is all on one floor and there are no internal stairs. Living room, kitchen, three bedrooms and bathroom are all on one level. 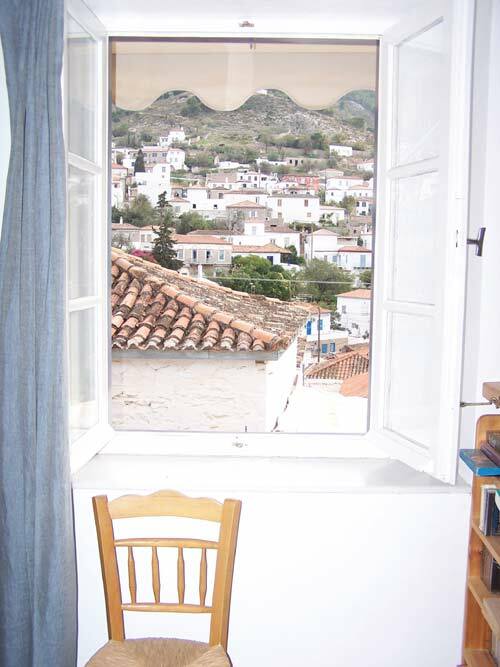 The main house is accessed via a large terrace with views across the valley to the interior of the island. There is plenty of space here to sit or dine out and enjoy the view, and large awnings provide complete shade from the sun. 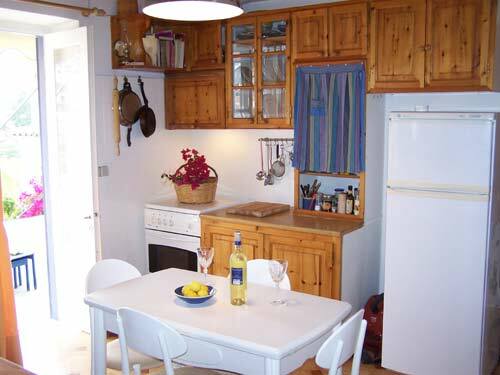 There is a large living room / kitchen, with breakfast bar dividing the two, and room for a small dining table. The living room has an impressive stone fireplace. One bedroom to the front of the house (being used as an office by the current owner) and two to the rear, all of a good size and all with plenty of built in storage. 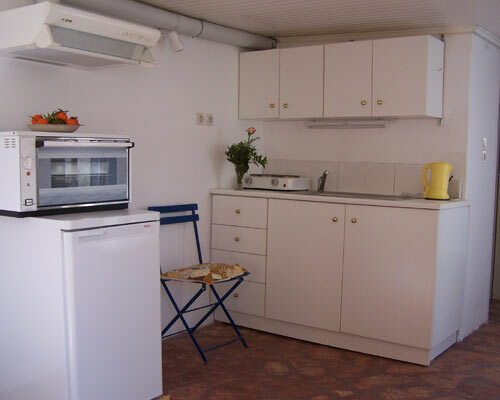 The bathroom is very large by island standards with a full length bath and plenty of room for a washing machine. 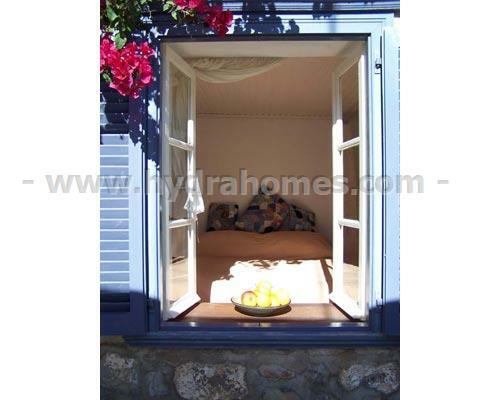 At the back of the house patio doors lead from both bedrooms to a very pleasant garden on two levels. The lower level is paved and includes a sitting area under a vine covered pergola. 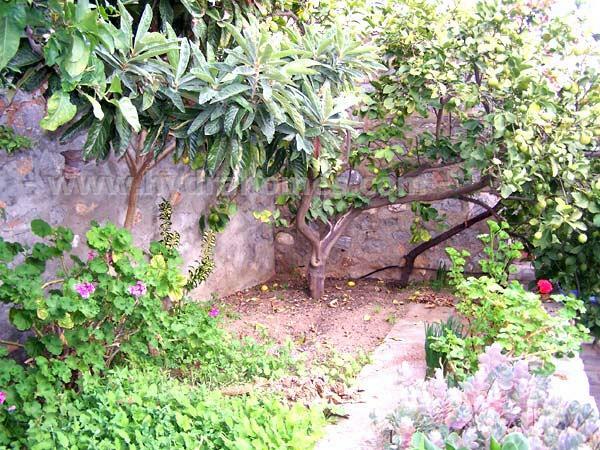 Steps lead to the upper level which is planted with fruit trees and flowering shrubs. 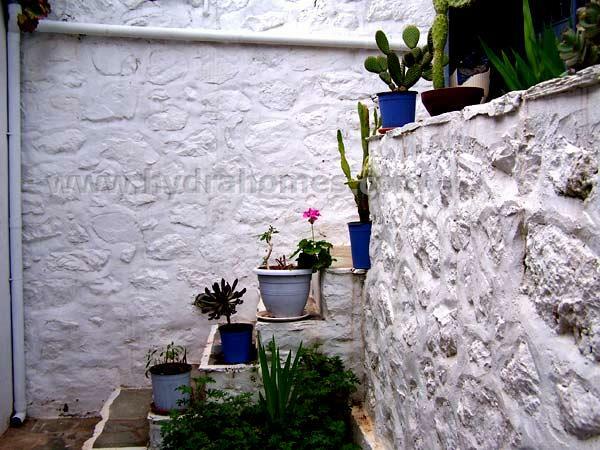 In the garden is a useful store-room which also gives access to a lane at the rear of the property. A sterna (fresh water reservoir) has been dug out of the floor of the store room, and this is fed by rain water running off the roof of the house. 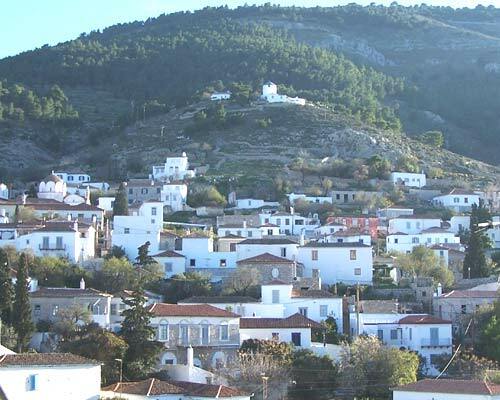 This water is fine for cooking and washing, and is a real advantage on Hydra where water is scarce. 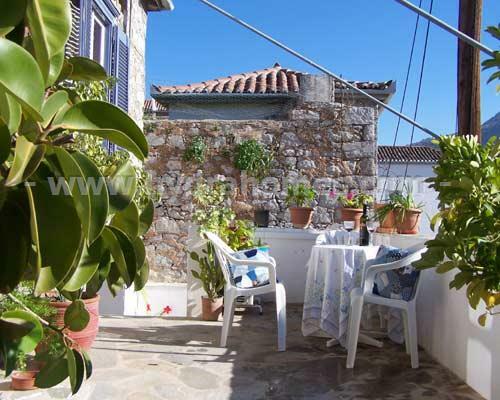 immediately below the main house, and included in the sale price, is a self contained studio apartment of about 25m2. This apartment has a sleeping area up a couple of steps, a kitchenette and a bathroom with shower. There are entrances from the street and from the interior of the property, giving complete autonomy. The house is very close to the Four Corners mini market. 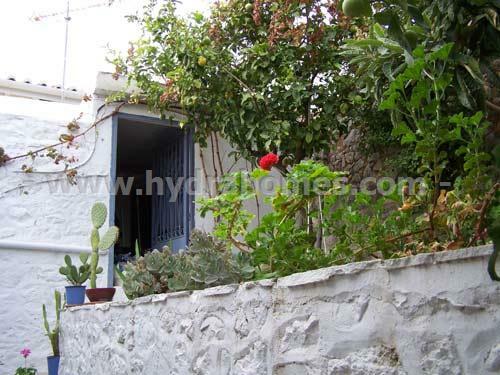 A good sized house near to Four Corners on Hydra in excellent condition - move in tomorrow. The main house is about 100m2, on a plot of 196m2. This house has an unusual layout for Hydra in that the living space is all on one floor and there are no internal stairs. 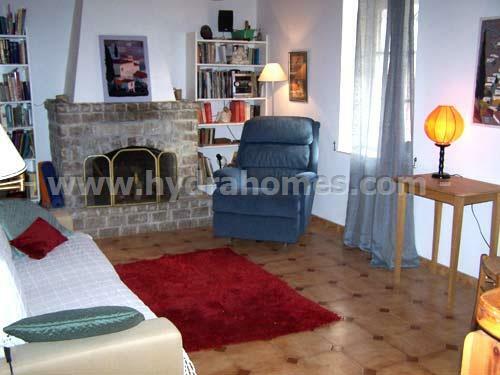 Living room, kitchen, three bedrooms and bathroom are all on one level. The main house is accessed via a large terrace with views across the valley to the interior of the island. There is plenty of space here to sit or dine out and enjoy the view, and large awnings provide complete shade from the sun. There is a large living room / kitchen, with breakfast bar dividing the two, and room for a small dining table. The living room has an impressive stone fireplace. One bedroom to the front of the house (being used as an office by the current owner) and two to the rear, all of a good size and all with plenty of built in storage. 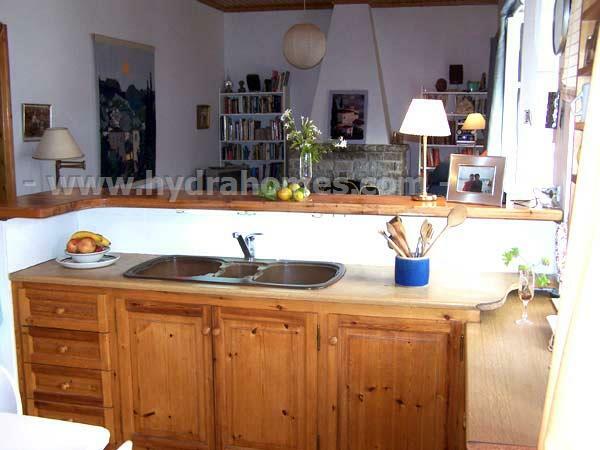 The bathroom is very large by island standards with a full length bath and plenty of room for a washing machine. 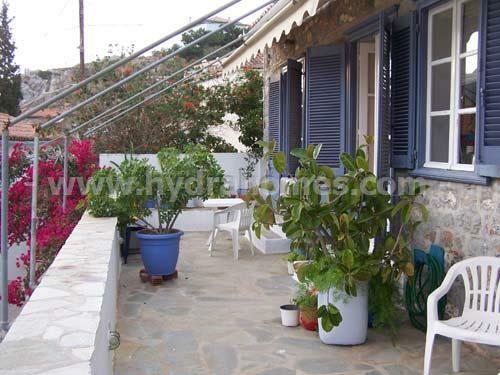 At the back of the house patio doors lead from both bedrooms to a very pleasant garden on two levels. 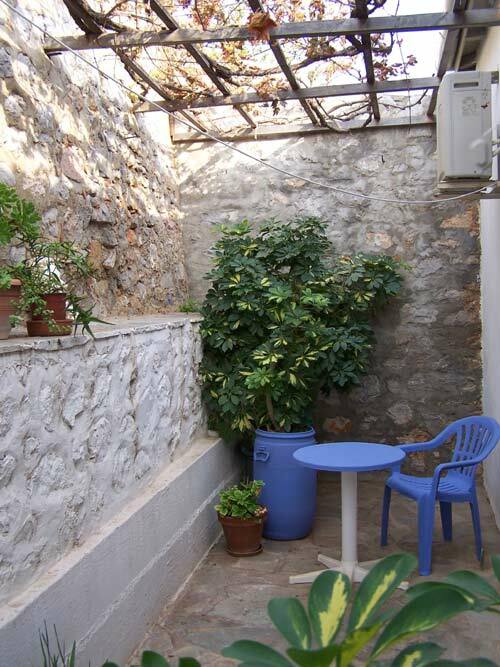 The lower level is paved and includes a sitting area under a vine covered pergola. 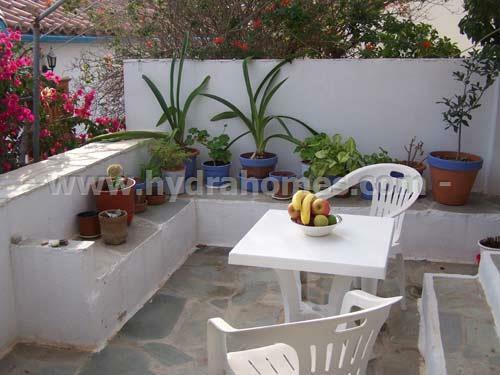 Steps lead to the upper level which is planted with fruit trees and flowering shrubs. In the garden is a useful store-room which also gives access to a lane at the rear of the property. A sterna (fresh water reservoir) has been dug out of the floor of the store room, and this is fed by rain water running off the roof of the house. 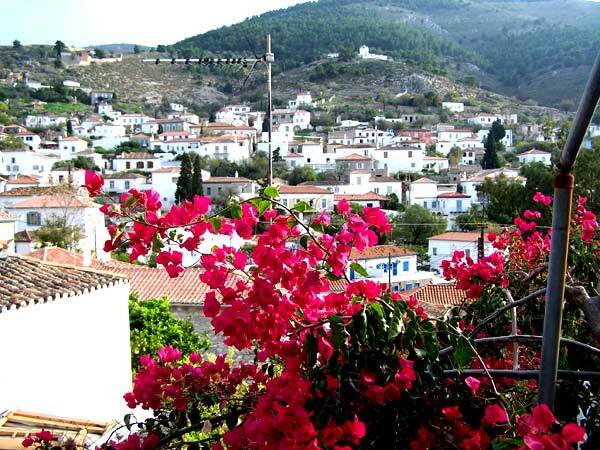 This water is fine for cooking and washing, and is a real advantage on Hydra where water is scarce. 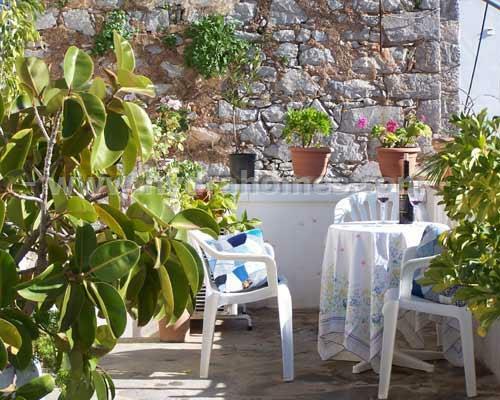 immediately below the main house, and included in the sale price, is a self contained studio apartment of about 25m2. This apartment has a sleeping area up a couple of steps, a kitchenette and a bathroom with shower. There are entrances from the street and from the interior of the property, giving complete autonomy. The house is very close to the Four Corners mini market. Please email: info@hydrahomes.com for more information about this property, or to arrange a viewing. 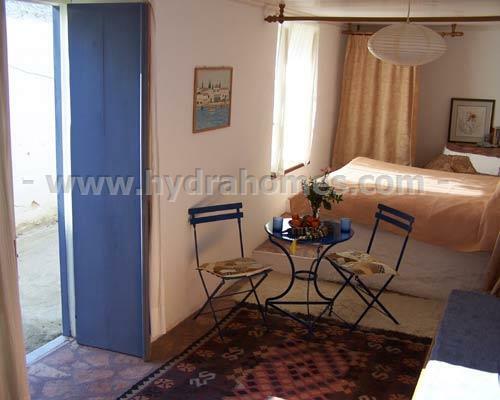 info@hydrahomes.com for more information about this property, or to arrange a viewing.